The “BOSS 490” was designed for the bracket racer running a heavy weight, hard body car weighing 125g+. It was designed to use 10T pinions for better gear mesh and better short times and yet still use very little glue to launch. This motor has more torque and topend than the PS-101 and is perfect for heavy hard bodies. Tests in a 125g MM/PS with 10/60 gears and 1.060 x .500 tires yielded ET’s in the .880’s @ 65+ mph in the ¼ mile. 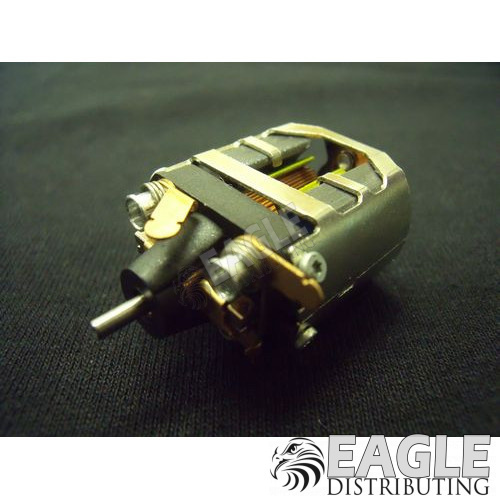 This motor comes blueprinted, a special “BOSS” armature and copper hardware installed. The dyno results say it all. For more in depth look at “THE BOSS 490” check out Martin Nissen’s website http://www.kahale-martinapmachine.net Marty has done extensive testing with “THE BOSS 490” and has posted some impressive tuning tips.